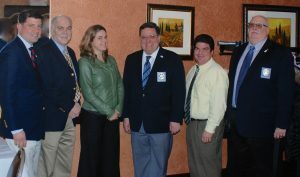 At a recent Nassau Suffolk Water Commissioners’ Association (NSWCA) meeting hosted by Manhasset-Lakeville Water District Commissioners Mark S. Sauvigne, Brian J. Morris and Steven Flynn, Chief Sustainability Officer for the Town of North Hempstead Erin Reilley discussed the Town’s 2017 Home Sustainability classes, offered during the spring and fall at Clark Botanic Garden in Albertson. Commissioners from the 21 water districts that comprise the NSWCA were in attendance. The classes include: Build a Rain Garden, Native Plant Gardening, Recycle the Rain (Rain Barrel) and Learn How to Compost. For more information or to register, call (516) 869 6311.